Tag line: "Bombed out in space with a spaced-out bomb!" John Carpenter’s debut feature, Dark Star, started life as a student project in the early 1970’s, when the director was still enrolled at USC. 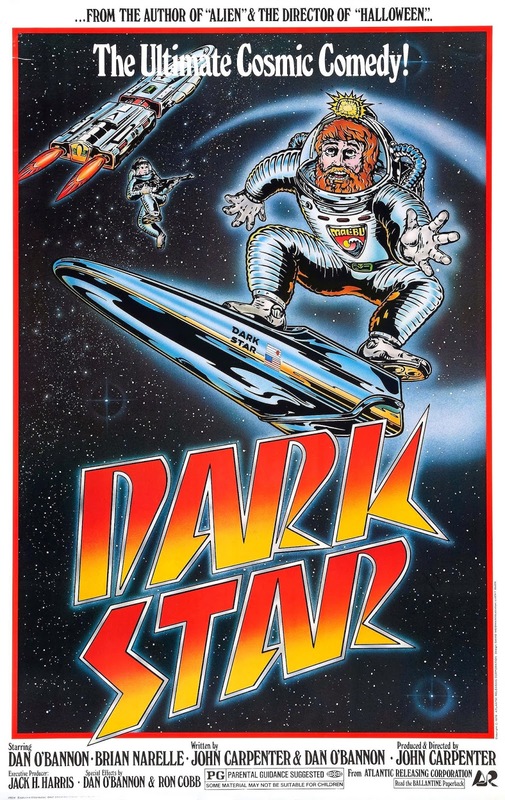 Based on a script he co-wrote with classmate Dan O’Bannon (who, in later years, would pen the screenplay for Alien), Dark Star is an ultra-low budget sci-fi comedy, pieced together, bit by bit, over the course of several years. The first time I saw the movie was in 2008, at which point I wasn’t all that impressed by it. But I have to say that, after a few more viewings, Dark Star has started to grow on me. After spending years together in the farthest reaches of space, the crew of the spaceship Dark Star: Doolittle (Brian Narelle), Boiler (Cal Kuniholm), Pinback (O’Bannon), and Talby (Dre Pahich) are going stir crazy. The only thing keeping them sane is their job: blowing up unstable planets (thus clearing the way for the colonization of surrounding worlds). Throw in an overly-playful alien, bombs that think for themselves, and a mainframe computer that’s more a hindrance than a help, and you have a disaster just waiting to happen. The special effects in Dark Star, while certainly on the feeble side, are much better than I would have expected, especially when you consider it’s a student film (Jack H. Harris, who produced, among other things, 1958’s The Blob, did kick in some money to help). Even more interesting are the story elements that eventually made their way into co-writer O‘Bannon’s script for Alien; aside from the fact both movies are about space travel as commerce, with crew members who view wandering the cosmos as nothing more than their job, there’s a scene where Pinback is chasing the alien, who the crew treats as if it were a pet, through the ship. Though played mostly for laughs, this sequence did remind me a little of when Ripley and her shipmates were carrying out a similar hunt in Ridley Scott’s sci-fi / horror classic. Dark Star definitely has its rough spots (Pinback’s chase goes on a bit too long, especially the scene where he gets stuck while crawling through a hatch in the floor of an elevator), yet the movie has such an odd energy to it that you can’t help but smile at the absurdity of it all (the alien Pinback is after is little more than a beach ball with feet taped to the bottom of it). Carpenter and O’Bannon would both go on to make better films, but with Dark Star, you get to see where they got their start, and that alone makes it essential viewing.